This post written by Jen – a fantastic team member here at HappyMoneySaver! I first discovered my love affair with all things coconut while in junior high. Sure, it was the fake, manufactured smell of Hawaiian Tropic, but still, I was hooked. My affection for coconut has only grown since then, especially since discovering the many uses of coconut oil, not to mention all of the health benefits! Not a day goes by that I don’t reach for my beloved jar. Let’s chat for a minute about why coconut oil is so awesome. Coconut oil contains lauric acid, which is a type of medium chain triglyceride (MCT). MCT’s help increase good cholesterol and lower bad cholesterol. It encourages efficient burning of energy (calories) in the body. In one 2009 study, researchers found that women who supplemented daily with about 2 tablespoons of coconut oil had lowered amounts of abdominal fat. Can I get a holla?? Coconut oil can also affect hormone and blood-sugar regulation for the positive. It boosts metabolism, energy, and endurance while increasing digestion and the ability to absorb fat-soluble vitamins. Coconut oil also aids in the fight against viruses, bacteria, yeast overgrowth, fungus, and candida due to its stellar antimicrobial and antibacterial properties. Bam. Tell me it’s not a miracle food. I’m basically in a hot and heavy relationship with coconut oil. It’s important to use unrefined, extra-virgin coconut oil. Once it’s been refined, a lot of the healthy properties are stripped away. I buy mine in a bulk jar at Costco for around $22. I love that it’s organic and has a nice, light coconut scent to it. I’ve heard Trader Joe’s coconut oil is fantastic as well, but I have yet to try it. 1. Eye Makeup Remover. I keep a little jar in my makeup drawer, and after washing my face I rub about ½ pea size amount over each eye and wipe away with a cotton ball. Below you can see what my eyes look like post-face washing, but before using coconut oil to remove makeup (top insert), and how nice and clean my eye area is after wiping my makeup away (bottom insert). 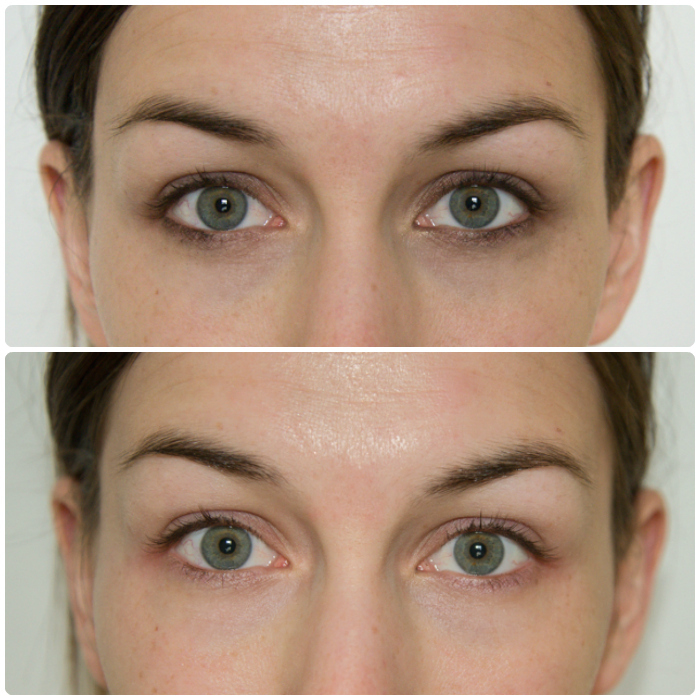 I’ve heard coconut oil also has great anti-aging properties, so double plus for using it on the eye area. 2. Deep Conditioning Treatment for Hair. About once a week I take a couple tablespoonful’s of coconut oil and massage it into my hair. (Please don’t use refined coconut oil!! It won’t shampoo out and will leave your hair a greasy mess!!) I leave it in for about 30 minutes and shampoo and condition like normal. This has been a lifesaver during the winter. My hair is shinier and healthier than ever. 3. Body Moisturizer/Lotion. After showering, I always rub down with a light layer of coconut oil. It keeps my skin moisturized without feeling heavy. It’s a little greasy for a minute or two, but soon seeps into your skin without leaving any residue. For my last 2 pregnancies I’ve religiously rubbed it on my belly and backside daily and have had ZERO stretch marks! 4. 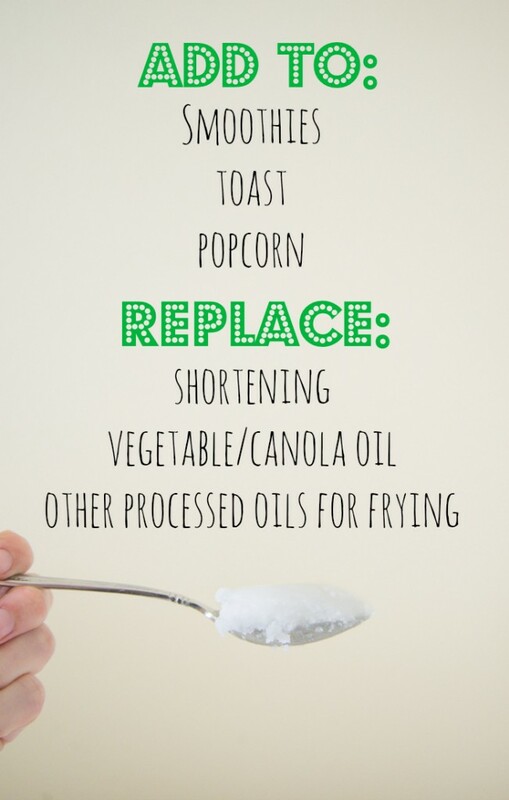 Healthy Replacement for Shortening & Processed Oils. My mom-in-law has the most fabulous banana bread recipe. The only downer is that it uses shortening as the oil. Gross. Don’t get me started on that stuff. About a year ago I started using coconut oil as a replacement and WOW people…the fabled banana bread became legend. LEGEND. And it was the coconut oil that took it up a notch. I almost exclusively use coconut oil as a replacement for shortening in baking recipes. I also use it for frying. Stir fries, sweet potato fries, chicken, and veggies pair fantastically when fried with coconut oil. 5. Energy Boost Supplement. This is one of my favorite uses for coconut oil I’ll mix a couple tablespoons into our steal cut oatmeal in the morning or throw some into our smoothies. Smother a bunch on some hot homemade bread with raspberry jam and then bask in its divinity. My kids love it as well. 6. Eczema Treatment. Both of my sons struggle with eczema. As soon as I see a patch beginning to flare up, I’ll massage some coconut oil into it a few times a day. As long as I catch it early, this is usually enough to take care of it. Another fabulous use of coconut oil. 7. Diaper Ointment. I use this as my primary diaper rash prevention trick. I rub about a pea size amount on my sons bum a couple times a day and the diaper rashes stay away. 8. As A Delicious Treat—in Popcorn! My husband and I love to air-pop some popcorn and use coconut oil instead of butter. Season with a little sea salt, and it’s basically a health food, right? Try it on your next movie night and let me know what you think. 9. Wood Conditioner. Coconut oil keeps my wood cutting boards from getting parched. 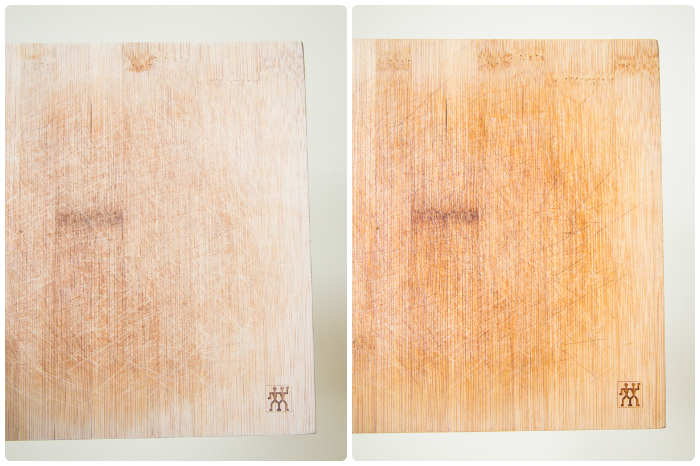 Below you can see one of my cutting boards before moisturizing, and after applying coconut oil. Oil your cutting board a couple times a month and your cutting boards will stay nice and lubricated. Speaking of lubricating..
10. Massage Oil and Lubricant. This should go without needing a description, but we like to keep a little jar in our nightstand. Nothing like adding even more health benefits to intimacy, right? Price wise, especially when bought in bulk, coconut oil is equally priced or cheaper than its counterpart I use it for. Add in the health properties and there’s seriously no comparison. Well worth its weight in gold, if you ask me. How about you? 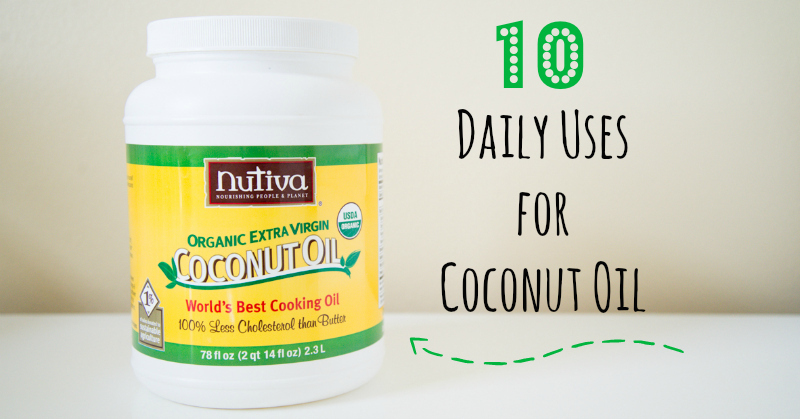 What are your favorite uses for coconut oil on a daily basis? Are you as obsessed as I am? Have you used coconut oil as a replacement for shortening in pie crust? Coconut oil is great for teeth whitening and plaque prevention. It’s called oil pulling. I use it in most of the ways you mentioned, but i also use it in place of shaving cream. And to remove extra dye from my hairline when I dye my hair. Coconut oil makes the best mouthwash ever! You swill about 1/2 to 1 teaspoon with great vigour for 2-5 minutes and it pulls all of the bacteria etc. from your teeth. If the oil has solidified because it’s a bit cold, just dissolve it in your mouth first. I started using this about a year ago because of random minor tooth pain with no known cause – the pain went away almost immediately and I’ve just had the best report ever from my dentist! I’ve also heard its great for your teeth and gums. I’ve read many blogs on this . Swish it in your mouth and thru your teeth for 20 minutes each day. It helps with almost all mouth and teeth problems. Its pulling the toxins out. It whitens your teeth and makes your teeth and gums healthier. As well as other benefits. Even cleans your teeth, to where you no longer need to use toothpaste. Look into it. Its becoming a big thing now a days. I’m trying it soon! Keep a dog from gnawing at its paws! Never use an oil-based lubricant if you use barrier contraception (i.e. condoms/female condom/cap/diaphragm/etc.). The oil will deteriorate the rubber/latex and you will be at risk for sexually transmitted infections and pregnancy! Costco brand is softer even at cool room temp and scoops easily. Don’t know about expiration dates on it. We usually just stir a little (to taste) into hot popcorn and it melts quickly. As for using as a hair conditioner, it’s great but you do have to shampoo really well to get it out – at least I do. But you hair feels fabulous. Great info! Does coconut oil expire? Also, the coconut oil I have is hard to scoop out- I have to almost chip it. Is the Costco brand that way? Do you melt it to put it on popcorn (in the microwave)? Thanks! with those gorgeous naked eyes why bother with eye makeup ? was so glad to read about your top ten reasons to use coconut oil i knew about the health benefits but some of the beauty secretswere new to me .i am sharing this with my daughters. thank you! Awwww…You’re so sweet Noele. Thank you! Hope you and your daughters enjoy!